This easily put together, all-in-one chicken dinner will definitely appeal to your family’s appetite. 1. Arrange chicken in bottom of a 5 quart slow cooker. Place the potatoes, carrots and green beans over chicken. 2. 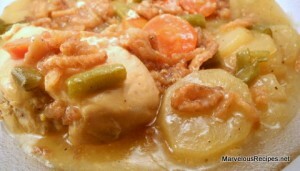 In a small bowl, combine the broth, gravy, salt, pepper, onion powder and curry powder. Pour over vegetables and meat. Cover and cook on Low for 5 to 5-1/2 hours or until chicken juices run clear. 3. In a small bowl, combine the cornstarch and water; stir into the cooking juices. Sprinkle with french fried onions. Cover and cook on High for an additional 15 minutes or until thickened. Makes 4 servings.